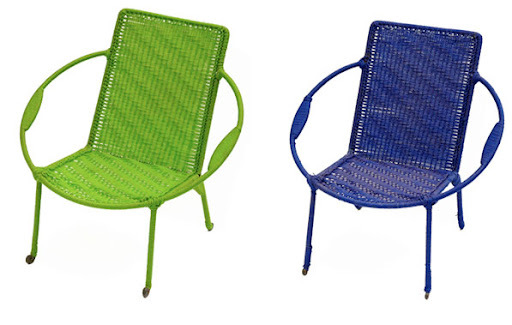 Plastic abounds when it comes to kid's furniture, (especially the outdoor variety) so these chic recycled chairs from Shak-Shuka are a refreshing departure from the norm. Made from recycled steel in Africa, under Fair Trade conditions, and wrapped in colorful rope, these sweet perches for tots look like a comfy landing pad for cozying up with a book and a pretend cup of tea, or for taking a break from gardening. Available in green, white, blue and blue/white.